Also, it's been ages since I've had a lemon meringue pie. Sift the flour and icing sugar into a large bowl. Use your fingertips to rub the butter into the flour mixture until it resembles fine breadcrumbs. Add the water and use a round-bladed knife to stir until a dough forms. Use your hands to bring the dough together in the bowl. Turn onto a sheet of non-stick baking paper and roll out to a 5mm-thick disc. Use the pastry to line a 23cm (base measurement) pie dish. Trim excess pastry. Cover the pastry with baking paper. Place in the fridge for 30 minutes to rest. Preheat oven to 180°C. Fill the lined dish with pastry weights or rice. Bake in oven for 15 minutes. Remove the paper and pastry weights or rice. Bake for a further 15-20 minutes or until crisp and golden. Set aside to cool completely. Meanwhile, to make the lemon filling, combine the cornflour, water, lemon juice and half the sugar in a saucepan. Use a balloon whisk to stir over medium heat for 4 minutes or until the mixture boils and thickens. The mixture needs to heat to 85ºC otherwise it will not set. Continue to cook, stirring constantly, for a further 1 minute. Remove from heat. Whisk in butter and egg yolks. Transfer to a bowl. Cover with plastic wrap and place in the fridge for 3 hours or until cooled completely. Preheat oven to 190°C. Remove filling from fridge to allow to warm slightly. Use an electric beater to beat the egg whites in a clean, dry bowl until soft peaks form. Gradually add the remaining sugar, 1 tablespoonful at a time until the mixture is thick and glossy. Spread the filling over the base of the pastry case. Spoon over the meringue mixture and spread to the edge of the pastry. Use the back of a spoon to create peaks. 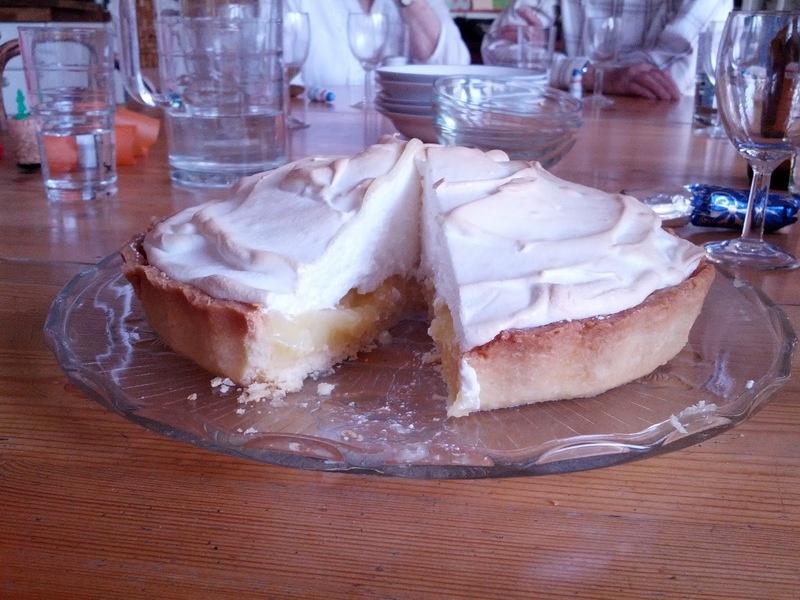 Bake in oven for 5 minutes or until the meringue peaks are light golden. Set aside to cool completely.